Often the best foods are simply prepared with minimal fuss and ingredients, and that is the case with roasted vegetables. With just some extra-virgin olive oil, kosher salt, and maybe some herbs, you can have a delicious and pretty side dish to serve for a weeknight meal or for special weekend dinners. I love roasted asparagus in the springtime. The spears are long and colorful, and they make a simple yet elegant presentation with any meal. Asparagus can make a fun vegetable for kids. I cut up some spears for my toddler during Sunday dinner, and after he devoured the bites he reached over and grabbed a whole spear off my plate and began chewing on it with great gusto! 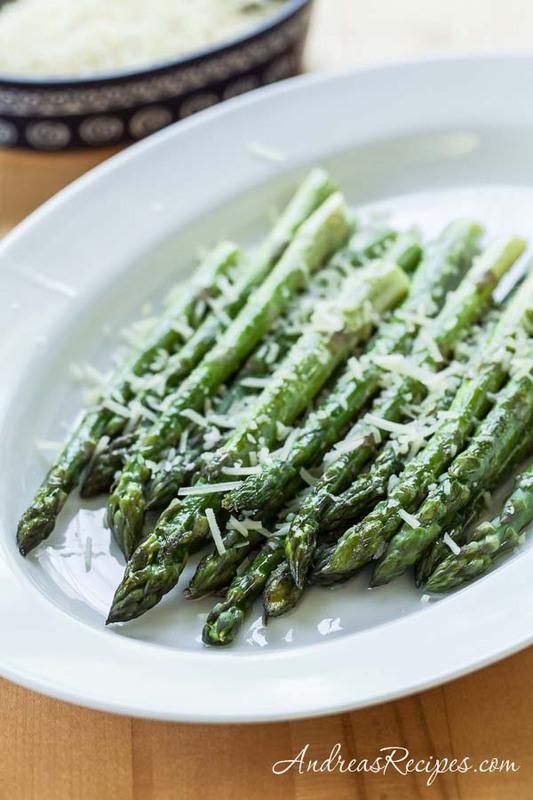 Preheat oven to 425° F/220° C.
Cut off the woody bottom part of the asparagus spears and discard. Place the asparagus on the foil and drizzle with olive oil. Sprinkle with salt and roll the asparagus around until they are evenly coated with oil and salt. Roast in the preheated oven for 10-15 minutes depending on the thickness of the stalks and desired tenderness. The tips of the spears can burn, so check often if cooking for longer than 10 minutes. Remove from the oven and transfer to a serving plate. Sprinkle on the Parmesan cheese, and serve immediately. The longest part of this recipe is waiting for the oven to preheat. If you have a counter top toaster oven, you can use that instead. The preheat time is much faster.